Radiation therapy is basically an effective use of radiation for the treatment of cancer.Radiotherapy damages the rapidly growing abnormal cells making them unable to multiply and divide with such a rapid rate. The body easily eliminates these cells when they die. Healthy cells are also affected by a radiation therapy but they have the ability to repair themselves which cancerous cells cannot. The main type of radiation therapy used for bladder cancer treatment is an external beam radiation therapy which is used in combination with chemotherapy. Sometimes internal radiation therapy or brachytherapy is also used. 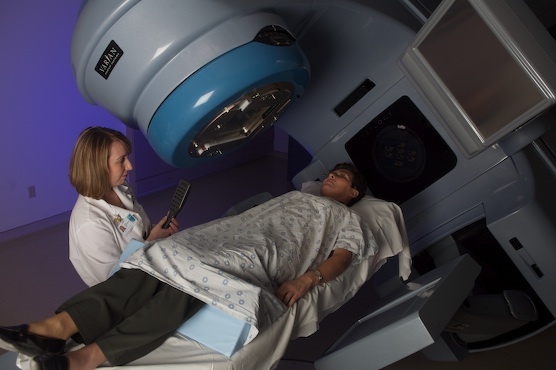 External beam radiation therapy involves a daily radiation delivery to the bladder.This treatment lasts for five to seven weeks and usually takes less than half an hour. 3-dimensional conformal radiotherapy (3D-CRT) generally combines multiple radiation treatment fields to deliver accurate and precise doses of radiation to the cancer. Intensity modulated radiation therapy (IMRT) is an improved form of the above mentioned test in which a radiation carves around the tumor. By the use of this technique, normal tissues are protected from radiation exposure. Side effects are usually temporary and only limited to the area that receives radiation. Patients experience only few side effects in this regard and can continue their normal routines. Some patients experience skin irritation, increased urination, bladder irritation, nausea, rectal pressure, abdominal cramping, fatigue and diarrhea. Some patients have reported sexual problems which include vaginal dryness and difficulty in achieving proper erection. These side effects usually go away with time. Patient should seek proper advice by a doctor regarding any discomfort if they feel so that, they may be able to provide treatments and drugs to help. Home remedies and treatment may help to provide comfort if such side effects appear.